Several words are used to describe the extent of a disc herniation seen on MRI examination. A disc herniation occurs when the soft cushion between the spinal bone ruptures. A portion of that disc can herniate, or push outwards, against the spinal cord or the spinal nerves. The pressure on the nerves causes the symptoms typical of a disc herniation. 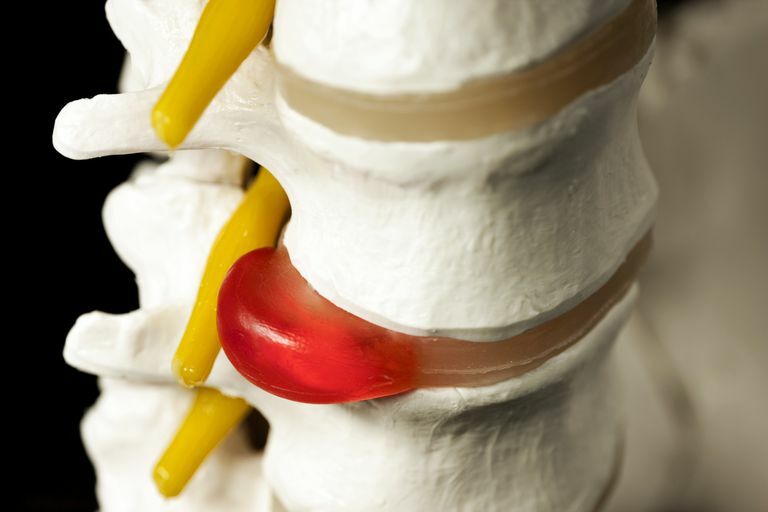 Disc Protrusion: Commonly called a disc bulge, a disc protrusion occurs with the spinal disc and the associated ligaments remain intact, but form an outpouching that can press against the nerves. Disc Extrusion: A disc extrusion occurs when the outer part of the spinal disc ruptures, allowing the inner, gelatinous part of the disc to squeeze out. Disc extrusions can occur with the ligaments intact, or damaged. Disc Sequestration: A disc sequestration occurs when the center, gelatinous portion of the disc is not only squeezed out but also separated from the main part of the disc. The specific type of disc problem that occurs does not necessarily dictate treatment. It is important to correlate the MRI findings with the patient's complaints and the examination findings. If these don't all point to the same underlying problem, then treatment is less likely to be effective. It is very important to know that disc abnormalities are very commonly seen on MRI tests, even in people who are completely normal. Therefore, just because someone has back or leg pain, and a disc abnormality on their MRI, it does not necessarily mean the two are related. They can be, but just presuming the two are related can lead to poor results of treatment. A skilled clinician can help you determine if the disc problem seen on an MRI is the cause of your symptoms. MRI machines use the differing magnetic properties of tissues to determine areas where there may be structural abnormalities inside the body. MRIs are not 100% accurate, but they are a very effective tool used to "see" inside the body. MRIs tend to give a better view, particularly of soft-tissue structures such as tendons, ligaments, nerves, discs, and cartilage, when compared to standard x-rays or CT scans. Each of these imaging types has effective uses, but MRIs are often the tool of choice when trying to assess the discs of the spinal column. The more common problem than not seeing abnormalities on MRI is sometimes seeing too much. Subtle findings may not be clinically important, but they may worry patients or cause people to seek out more invasive or expensive treatments than is appropriate. If you see abnormalities of the discs on your MRI report, it's a good idea to discuss with your doctor if she thinks these are clinically relevant to your problem.